Zmurko depicts Lazarus is in the tomb, but the light shining on his body suggests that the stone blocking its entrance has been partially pulled away. He is unconscious, perhaps still dead, but he also seems to be listening. Does he hear the voice of Jesus, calling his name? Zmurko specialized in paintings in which the subject seemed half-awake, half-asleep. The person in this painting, Lazarus, is not bothered by thoughts, but rests in an unconscious state. 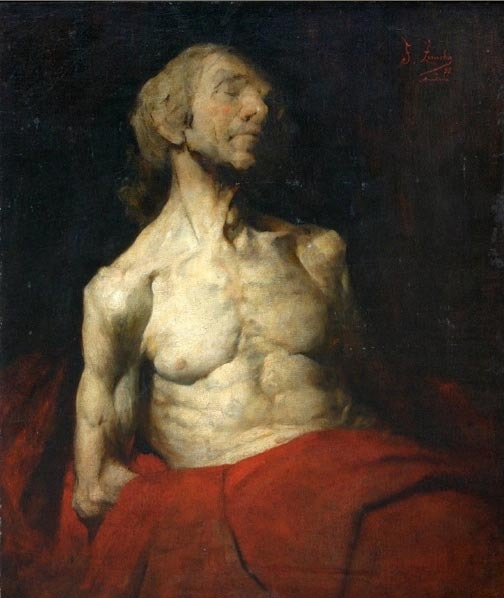 His muscles are shrunken in death but his face has a look of utter peace - and why not? He has led a good life and been a friend of Jesus - could he ask for more? Franciszek Zmurko (July 1859 – October 1910) was a Polish painter. Zmurko began drawing lessons as a young boy in his hometown with the painter Franciszek Tepa. As an adolescent he moved to Krakow to study at the Academy of Fine Arts where he had lessons from Jan Matejko. In 1877 Zmurko moved to Vienna, Austria where he was accepted at the Vienna Academy, but left soon thereafter to study under Aleksander Wagner in Munich. Zmurko returned to Krakow in 1880 and then moved to Warsaw in 1882 where he remained until his death in 1910.